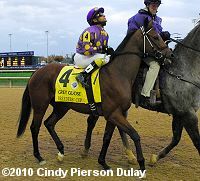 A field of 13 two-year-old fillies went to post in the $2 million Grey Goose Breeders' Cup Juvenile Fillies (G1). Awesome Feather, undefeated in 5 starts all against Florida-breds including the My Dear Girl Stakes last out, was sent off as the lukewarm 4-1 favorite in this 1 1/16 mile main track event. 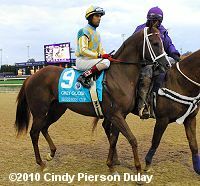 Also in the field were 4.2-1 second choice A Z Warrior, winner of the Frizette (G1) at Belmont Park, and 4.7-1 third choice Theyskens' Theory, third in the Fillies Mile (G1) at Ascot after winning the Prestige Stakes (G3) at Goodwood. Theyskens' Theory and 5-1 R Heat Lightning contested the early pace through fractions of 23.90 and 48.14 over the fast track while being stalked by Awesome Feather third. R Heat Lightning stubbornly held the lead into the lane, but Awesome Feather was up to the challenge, passing her at the 1/8 pole and powering away to a 2 1/4 length win in 1:45.17. It was another 2 1/4 lengths back from R Heat Lightning to 11-1 Delightful Mary third. Awesome Feather wins the Juvenile Fillies. Left: Awesome Feather heads to the winner's circle. Owner Fred Brei said, "We're a small breeder. We only have 14 to 16 foals a year. You know, we foal the mares on the farm, raise the foals, take them to our training barn, break them, get them ready to go to Stanley at Calder. And we do it year after year hoping we're going to get the good ones. We bred and own her sire, Awesome Of Course. And we bought her dam as a yearling and raised her. So when you have a double homebred, that's as good as it gets." Right: Awesome Feather in the post parade. Jockey Jeffrey Sanchez said, "I waited and waited with my filly. I wanted to make one move with her. When I asked her, she went. Then, when we got in the stretch with (R Heat Lightning) and when she bumped us, my filly tried harder. She came away from that other filly. I love this filly. 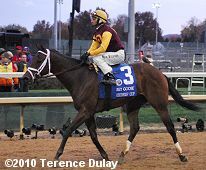 The first time I rode her, I told everyone that this was a champion filly. 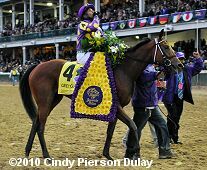 Now she is a champion filly." Left: Second place finisher R Heat Lightning returns after the race. 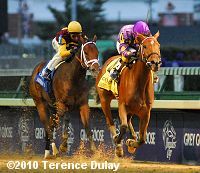 Mike McCarthy, assistant to trainer Todd Pletcher said, "The filly ran a fantastic race. It's a bit unfortunate that she didn't have a target to run at, but she put up a good fight down the lane; a very respectful effort." 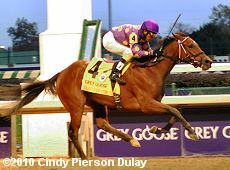 Jockey John Velazquez added, "She just kept switching leads back and forth in the stretch. She never got to really relax the first part of the race. Even though she was on the lead, she didn't get into that nice relaxed rhythm." Right: Third place finisher Delightful Mary in the post parade. 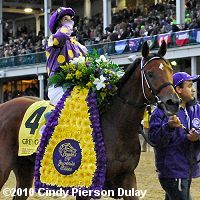 Trainer Mark Casse said, "That's the horse (winner Awesome Feather) I said we had to beat. She's tough. If I could have eliminated one horse in the field it would have been her. But my filly did run a good race. Shaun (Bridgmohan) gave her a great ride. I'm proud of her."